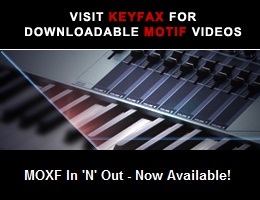 Viewing topic "Motif XF arpeggiating a drum loop in Performance mode keeps retriggerring"
I’m trying to live-play bass lines, chords and melodies in Performance mode, but the drum arpeggio keeps sounding and retriggering in my new Motif XF. The the performance was imported in from ES into Performance usr bank3. Every thing is there, 5 correct beats, tempo, and sounds as laid across the 4 Performance parts. BUT, the drum loop keeps retriggering and sounding as notes are hit. On my old ES, I could play on top of part 4 acting like drum machine. I have,looked at manual and carefully examined the parameters and menus, but have not yet found where I can shut-off the sounding and retriggerring of the arpeggio drum loop. I’d suggest checking whether Accent Velocity Threshold is on, and if so, at what value. The default is 64, which typically means that it doesn’t take much of a key strike to trigger it. See (10) Accent Vel Threshold on pages 114-115 of the XF Reference Manual (http://download.yamaha.com/file/48531).